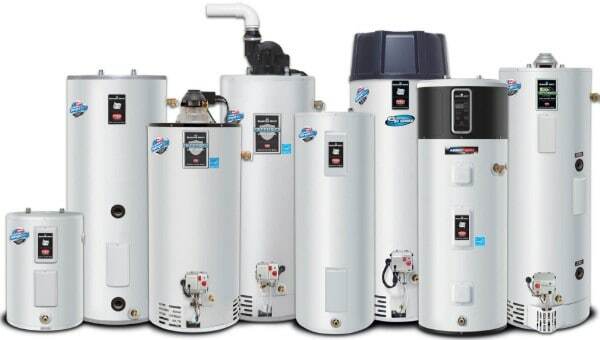 Get a professional water heater installation by Clovis Plumbing Services! Offer applies to the purchase and installation of a 40-50 gallon water heater. Ultimately (usually at the worst possible time), your water heater is going to quit working. The fastest remedy is to get a professional water heater installation. However, if you prefer to do it yourself, then keep reading. Replacing a water heater isn't difficult, but calling a local plumbing inspector is advisable. For step by step instructions, follow along with this article and you'll have hot water before you know it. When selecting a water heater it's best to get the same type, whether it's gas or electric. You can switch sizes though, within reason. You might even consider a Hybrid Water Heater. This type installs like a traditional tank type water heater installation. Inspect the piping that connects to the old water heater and make sure there is a shutoff for the cold water. Confirm there is a union for the hot water and union on the gas line if you have a gas unit. If you don't have these you'll have to install them prior to putting the new unit in place. Unloading and installing a water heater up to 50 gallons can be done by 1 person. However, I recommend 2 people for the job. I also recommend using a hand truck if possible. You can rent one from Home Depot and it makes the entire process a lot easier. Close the main water valve or the valve to the existing water heater. If you have an electric model, shut off the electricity by turning off the circuit breaker. For gas models, turn off the gas at the point of connection (POC) or at the meter. Open several hot water faucets nearest the unit. Connect a garden hose to the drain valve at the bottom of water heater. Place other end of hose over a drain or run to curb. Open the valve slowly to avoid clogging the valve. For gas units, disconnect the gas line to the water heater. For electric units, shut off the breaker switch to the water heater. Tools required are a pipe wrench, channel locks, and large crescent wrench. Disconnect the cold water at the shut off valve. Detach the hot water line at the union. Unfasten the vent pipe from the unit. You are ready to remove the old water heater. Once the old water heater is drained and disconnected, remove the unit. Clean up the floor area where the old water heater was located. Set the new water heater into place. Level the new unit by placing shims under the legs. Install all fittings that came with the unit. Insert the t&p valve (temperature/pressure relief valve); connect to drain line. Use pipe dope and teflon tape on iron pipe fittings. Install any additional fittings as per manufacturer and local plumbing codes. For ease of installation, use flexible supply lines. Install a shut off valve on the cold water supply (if not already installed). Use dielectric unions to prevent damage @ pipe connections and water heater unit. Apply pipe dope and teflon tape on galvanized fittings. For electric water heaters, connect power to the water heater junction box. On gas units, connect the gas line to the control valve. Use a flexible gas line for ease of installation. Turn on the gas and spray soapy water in a spray bottle on all connections. If you see any bubbles, tighten the connection. For gas models you need to attach the vent pipe. Install draft diverter over the water heater flue. Check for specific parts and instructions for the water heater installation. Install the vent pipe as per manufacturer and local codes. Once all connections are made, fill the water heater and turn the unit on. Turn on the cold water valve to the water heater. Close all hot water faucets that were opened before draining the water heater. Fill the tank. Open the relief valve and when water comes out, the tank is filled. Open main gas valve and light the pilot. OR :: reset the circuit breaker (if electric). Set the thermostat between 110 and 125 degrees. The ultimate in convenience is having hot water instantly available at every plumbing fixture. Hot water circulation increases efficiency and saves energy by utilizing a programmable timer to deliver hot water during peak demand. The Grundfos Comfort System can be installed in about an hour and typically costs a few hundred dollars. Some of the fastest growing counties are requiring hot water recirculation mandatory for all new construction. If you have any questions, please do not hesitate to contact our plumber in Clovis Ca. We are available Monday through Saturday from 7 am to 5 pm to help you with any questions you may have.